"The time for insouciance is long past. . . . In the face of the evil that confronts the world, I cannot stay silent." Silence may be a virtue. Silence may be a vice. Silence in and of itself is neither virtuous nor wicked. The book of Ecclesiastes says, “For everything there is a season … A time to keep silence, and a time to speak” (3:1,7). Don’t bury your head in the sand. There is a battle waging with little to no sidelines. It is clear: Those who wish to aggressively force an anti-moral, anti-christian, anti-traditional manner of life on everyone will not be silent. They make noise about it everywhere. No place is sacred, not even the Christian Faith. They wish to soil everything with their “progressive” death march. They desire to silence all opposition. I must speak. I do not know how effective my small voice will be. But at least I will be able to say that I raised it. I will make my feeble attempt to speak out against the darkness of the times. In the face of the evil that confronts the world, I cannot stay silent. Everyone is informed by something, by some philosophy of life. We, as people, freely and willingly give ourselves to some type of reasoning. I have freely given myself to be influenced and guided by the Orthodox Faith — It is the main foundation upon which I will endeavor to base my thoughts and observations. “People do not light a lamp and put it under a basket, but on a stand … in the same way let your light shine before others” (Mat. 5:15-16). “Awake, O sleeper, and arise from the dead, and Christ will shine on you” (Eph. 5:14). The time for insouciance is long past. The darkness hates the light and will do anything to silence it. Even darkness must pass. Only Light is eternal. Fr. 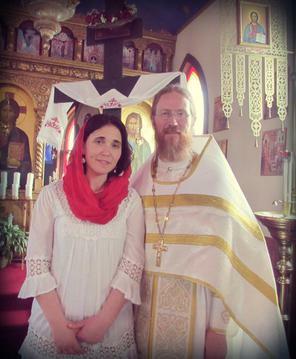 Zechariah Lynch is an Orthodox priest in Pueblo, Colorado, at the Archangel Michael Orthodox Church. He blogs at The Inkless Pen, and is a regular contributor at Russian Faith.